At the edge of forests in Cameroon, researchers saw gangs of up to 15 ants (Crematogaster striatula) waft a venomous vapor from their stingers at a termite. 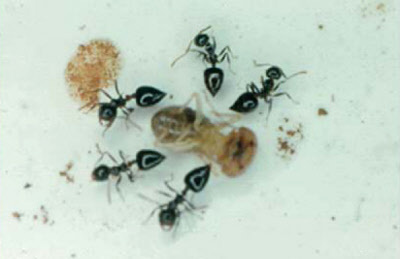 The ants then watched from a safe distance as the much-larger victim became paralyzed, died, and later dragged back to their nest (seen in picture), the researchers report today in PLoS ONE. The remote-action poison allows the ants to kill prey without exposing themselves to harm. Even the threat of the poison seemed to scare off enemies, including other species of ants, which abandoned drops of honey when confronted with a loaded C. striatula stinger. The researchers hope that once the paralyzing molecule is identified, their discovery will lead to new insecticides effective against pests that shrug off older products.